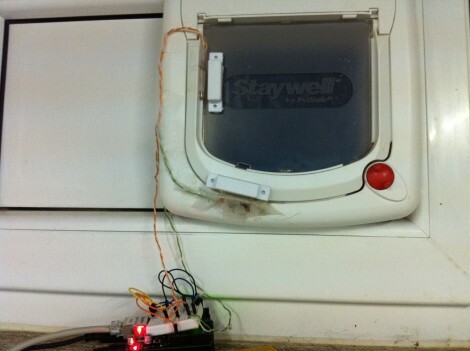 This Tweeting cat door uses the Electric Imp to read a sensor and report back to the server. The hardware is pretty neat. The board hosts an ARM Cortex-M3 processor and gets on your home network via WiFi. The mini-USB cable simply provides the power. Programming is done over the network. Our own [Brian Benchoff] had a chance to try the Imp out earlier in the Fall. 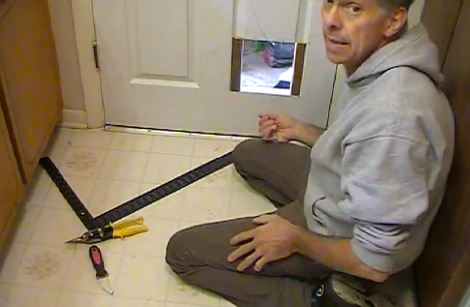 Monitoring a cat door is as good a reason as any to undertake a project. The hardware added to the board includes a reed switch mounted on the jamb along with a magnet on the door itself. There is also a blue LED that gives a bit of user feedback. The software isn’t quite as easy but it still wasn’t that bad. As with most web-connected projects getting all the parts to talk to each other was a bit of a chore. The Imp reports back to a server on the local network which then activates a PHP script that uses Sen.se to push out a Tweet. Dogs may be man’s best friend, but cats are certainly a hacker’s best muse. They provide so many ‘reasons’ for projects, like this cat door which [Clement] augmented to monitor the comings and goings of his feline friend (translated). He’s using a web service we hadn’t heard of before called PushingBox to send notifications like Tweets and Emails from the Arduino monitoring that door. The two white rectangles attached to the cat door in the image above are magnets commonly used for entry door monitoring. Using a pair of them along with reed switches lets the system differentiate between an incoming or outgoing cat. The Arduino is web-connected and running the PushingBox API to manage the notification messages. See a demo of the system in the clip after the break. 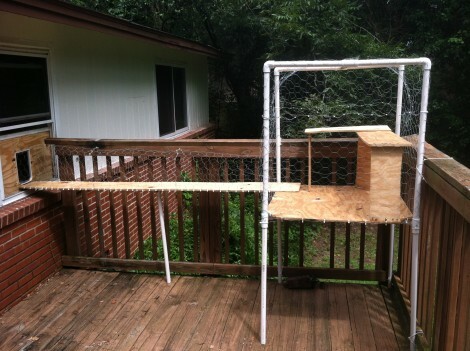 [Dino] continues his to satisfy his weekly hacking goal by building a cat door for his pets. He has a Habitat For Humanity resale store nearby that was doing a 50% off sale on doors. So he picked up a six-panel door and set to work. The first step is drawing out the opening and cutting it with a jigsaw. Once he was done, there’s some reinforcement work to be done because this is a hollow-core door. Since he had already cut a bit of the bottom off of the door to fit his jamb opening, he had some wood stock that was already the right thickness. That bit was secured to the top and bottom of the opening with glue and some brads. The same was done on the sides with a different piece of scrap, then the door was hung in the opening to reach the point in the project seen above. Here [Dino] prepares to add a flap to cover the opening. He used acrylic for the flap because it’s light-weight and clear. A piece of piano hinge makes it easy to swing in both directions. The final touch is a magnet which keeps the flap from swinging in the breeze using parts from a magnetic cabinet latch. No sooner does he have the flap in place than a brave kitty gives it a test run. Hopefully he doesn’t have the kind of pests that caused other hackers to build facial recognition cat door locks.